The first in an occasional series? These laws will never be more popular or well known than Murphy's. You can't do anything without doing three other things first. The piece of paper that you had in your hand five minutes ago and that you need right now will invariably be impossible to find. I'll leave it you to evaluate whether these rules are truly universal. Feel free to conduct a lively debate in the comments. In the meantime, have a Happy New Year -- and be careful out there. Today we must begin with a description of the Curmudgeon home. No doubt you picture a spacious McMansion, but the truth is, as it often is, far less grand. The first part of our home was built sometime before World War II -- which, in Chicago at least, usually means before the Great Depression. I won't say that no homes were built in Chicago during the 1930's -- someone would surely contradict me -- but I believe I'm on firm ground in asserting that very few homes were built in our area during that unhappy decade. I don't know exactly when the original structure was built, and I'm not certain about the original floorplan, but I'm pretty sure it was small, a tiny square, two-bedroom Georgian with a single bathroom at the top of the stairs. At some later time, a kitchen was added off the west end of the house. The kitchen is behind an attached one-car garage. My guess is that the garage was attached at this same time; I'm guessing that this is so because there is no direct access from the garage to the house. Two more bedrooms were added at this time, too, over the kitchen and the garage. And the original kitchen was reconfigured into a powder room. I'm hoping that some walls were moved at this time because the powder room is just as small as you'd expect; I'm hoping the original kitchen was larger than that. It may have been at this time, too, that a porch was built off the north end of the house behind the dining room. At some point in the history of the Curmudgeon manse this porch was allegedly converted into a year-round room, with glass sliding doors at the north end. I say allegedly because this room was -- and is -- almost unbearably cold in the winter and stifling in the summer. And we ran heating and cooling vents in there. But this gets ahead of the story. If you've followed along so far, in your mind's eye you can see a roughly "L"-shaped house, built in classic Future Tear Down Style, the long part of the "L" being two stories tall and the porch forming the short end. This was the layout of the house when we acquired it in 1996. But my wife wanted more room for the kitchen and it occurred to me that we could put a room up behind the kitchen and accomplish this. I suggested another powder room behind the existing. Another designer might have envisioned a wider opening between the existing porch/den and the new room but I figured that the floor might not line up exactly. This turned out to be a very good guess. We put a long closet on the other side of the powder room to make the communication between the new and old additions as narrow as we could; it turned out to be a chore to make even this narrow hallway level where the new and old structures met. The other reason I wanted another powder room was that I was learning, while trying to sell my first house, an unexpanded two-bedroom Georgian into which a third bedroom had been shoehorned, that the lack of a second toilet would cost me something like $50,000 in resale value. My original concept for the addition, therefore, had rows of toilets along both walls, like an airport or movie theater bathroom -- but Long Suffering Spouse talked me out of that. Our misadventures in building the addition will stretch to multiple chapters in the memoir, and I'm testing your patience, even in this slow, inter-holiday week, by larding in so much description. On with your story! you say and I can only bow my head in acknowledgment of your legitimate demand. Rodent did sleep in the new bathroom on Thanksgiving night. On the day after Thanksgiving, when Oldest Son and Abby got up at the crack of dawn to leave for Southern California (they had the sleeper sofa in the old den on the other side of the new bathroom), their faithful hound heard them and started whining. And scratching. This apparently continued the entire time while I was taking Oldest Son and his bride to O'Hare. On the futon in the new addition, Hank found it impossible, for some reason, to sleep through this. Hank was definitely not pleased to see that the dog had returned for Christmas. And Rodent had become increasingly insistent about not being cooped up in the new bathroom at night. Rodent does not bark -- not really. It makes an occasional noise that could be likened to the bark of a real dog, though shorter and higher-pitched. But it can make a fair amount of skittering noises on a vinyl-tile floor, and it could bang its head against the bathroom door trying to bounce it open. (She's succeeded more than once.) Although she's a dog who is alone most days in Oldest Son's apartment, Rodent has apparently decided that, in our house, with so many people, she must never be alone. Thus, she protested mightily at all efforts to contain her in the new bathroom. This was alright as long as no one was trying to sleep in the next room; we could, and did, barricade her in the room successfully on the night of the 24th. But Hank and his wife arrived on the afternoon of the 25th. Thus, it came to pass that, at about 4:00 a.m. on St. Stephen's Day, Hank dispatched his wife upstairs to get her sister. Older Daughter was more than willing to undertake this mission; the mutt was driving her nuts too. Younger Daughter says her big sister came tromping up the stairs like all three Billy Goats Gruff, shaking her awake and screaming at her to do something about that d*mn dog. Older Daughter says she was very quiet, although insistent that her little sister remove the dog. Since Long Suffering Spouse and I slept through this entire incident, I'm inclined toward Older Daughter's version of events. Either way, the dog was brought upstairs. Hank went back to sleep. But Hank may have had his revenge. I mentioned yesterday that Hank was running a fever. It hit him Sunday afternoon. Like most dogs, Rodent is instinctively drawn to a sick person. She was as attentive to Hank as she could be (trying to make peace as well? ), licking his fingers and so forth. This morning Rodent threw up. Oldest Son and Abby come home tonight. Happy Holidays to me! It's almost over now, as I write this early Monday afternoon. My son-in-law Hank is still at the house, battling a 102° fever while his wife visits her Abuela and then a high school friend. Older Daughter's still mad at her husband because he had to sing at his Indianapolis church on Christmas Eve and she couldn't come to Nochebuena dinner here in Chicago. (If you want the whole story, click here.) Now she's mad at him for being sick. You'd think that a nurse would realize that being sick is not exactly a voluntary thing... but that's beside the point, I suppose. At some point, probably this afternoon, Older Daughter will relent and take her husband home. My Long Suffering Spouse will begin fumigating the den. And we'll be down to only one house guest. If you guessed that this is a reference to Younger Daughter, you're wrong. I don't count Younger Daughter as a house guest, not when she's just home from college for break. No, our remaining guest is Oldest Son's dog. Oldest Son and his wife Abby were here for Nochebuena; I took them from dinner straight to O'Hare so they could get on a plane for San Antonio to spend Christmas with Abby's family. Their dog was supposed to go, too. At least that's what I was told originally. This has been a busy year for Oldest Son. He got married, got a dog, and bought a car, in that order, all this year. Shortly after Oldest Son and Abby got the car, they came out to visit -- with the dog. The dog is tiny, hardly worthy of the title 'dog,' really. They have a different name for it, but I call it "Rodent," since it is much more rodent-sized than canine-sized. By breed, the dog is a Shih Tzu. The Shih Tzu is a Chinese lap dog of ancient lineage. It was a favorite of high nobility, even emperors, because of its diminutive size and long, silky fur. In an ancient Chinese dialect, Shih Tzu means "What The Little Dog Will Do On Your Rug." When we first met the little creature, Long Suffering Spouse and I asked how Oldest Son and Abby were going to tend to its basic needs, since both of them work long days (and Oldest Son frequently travels on business). How was it going to get outside to do what doggies do? It's a feature in chic, urban neighborhoods: Well-dressed, well-educated young people, walking well-groomed dogs -- and carrying baggies or plastic grocery bags and scoops or little shovels for when the dog does what a dog must. Pickpockets take a terrible risk in such neighborhoods: You might get a yuppie's wallet. On the other hand, you might get a yuppie dog's latest souvenir. Oldest Son agreed he and Abby wouldn't have time to walk the little creature. She'd probably freeze solid on a typical Chicago winter morning anyway, he told me. Therefore, they'd "paper train" the dog and leave it all at that. Naturally, newspapers are no longer used by the young people even for paper training. Oldest Son pretends not to know what a newspaper is, anyway. (He has a whole routine worked up about 'someone putting the Internet on paper.') Instead, Oldest Son and Abby have bought "puppy pads," absorbent squares of treated paper (I guess). They set out one of these for Rodent each morning before leaving for work. They claim this works for them and for Rodent. I was less enthused. I was a tad queasy about the set-up, truth to tell. The arrangement has a high 'ick' factor, so far as I was concerned. And in our initial visit with the little creature, I made it quite clear to Oldest Son and Abby that I didn't want any animals in my house that aren't housebroken. Period. End of discussion. Don't bother moving to reconsider. Now we get to Thanksgiving. Oldest Son and Abby had plans to leave the morning after Thanksgiving to fly to Southern California for the Notre Dame game. I didn't get a chance to write about this at the time because of the appellate emergency I was dealing with, but because I knew that Oldest Son and Abby would be staying with us on Thanksgiving night, as the big day approached, I began asking who was going to be taking care of their little dog. At one point, fairly early on, Oldest Son assured me that a friend was doing the honors. But, as the day approached, I began to pick up subtle signals that a hitch might have developed in the dogsitting plans. I took each and every opportunity to reiterate, in no uncertain terms, in my best James Earl Jones Voice of Authority, that no way and no how was that little mutt to cross my threshold. I happened to be looking out the living room window on Thanksgiving when Oldest Son and Abby pulled up and got out of the car... with the little dog. I was angry. I was ticked off. I was, you should pardon the expression, pissed. The friend couldn't dogsit after all, Oldest Son explained (after I calmed down enough to ask). That's when Younger Daughter stepped in an volunteered to look after Rodent. She'd gone over to Oldest Son's apartment before to watch the dog, earlier in the football season, in fact, when Oldest Son and Abby made a day trip to South Bend. And Oldest Son made a show of surrendering the apartment keys to his sister, as if we'd really let her go back there alone for the weekend just to keep the dog out of the house. Besides, offered Oldest Son, trying to smooth the troubled waters, he'd brought a supply of "doggie diapers" so that Rodent wouldn't leave behind any unwanted Thanksgiving leftovers. No, I'd never heard of doggie diapers either. They have an opening for the tail, but otherwise look like standard issue Huggies. And just like paper diapers for little humans, sometimes they work better than others. Somehow, we got through Thanksgiving weekend. I was still cranked out of shape, but who listens to old Dad anyway? The one thing I made clear to Oldest Son and Abby upon their return was that this was our one and only foray into the dogsitting business. This was an imposition, I said, and it was rude, and it was never, ever to happen again. I looked to Long Suffering Spouse for reinforcement -- present a united front! that's the first thing they teach in the parenting correspondence course -- and Long Suffering Spouse nodded gravely and began to speak: "Your father is right," she began... and then she put in a loophole big enough to drive a kennel full of Shih Tzus through. "You should have asked us," she said. "You can't leave the dog with us without asking first." "And you know what the answer will be," I said, trying to recapture the advantage. Even little Rodent saw through this feeble effort. As I mentioned at the outset of this essay, the cover story for Christmas was that the dog would be flying to San Antonio with Oldest Son and Abby. Abby's twin sister had bought a pocket-sized pooch of her own and Abby was eager for Rodent to meet its "cousin." I supported this plan wholeheartedly. "Yes, this sounds like a great idea," I said to one and all and, at first, it seemed as if this might actually work out. I heard they even bought a carrier in which the little mongrel could travel. But, once again, as the big day approached, I began to sense a disturbance in the Force. Suspicious now, I was watching Younger Daughter to see if she betrayed any guilty knowledge. Thus, a few days before Christmas, I knew what was about to happen when Oldest Son called the house. "You talk to him," I told Long Suffering Spouse. "If he's calling to ask me, you know what my answer will be." I still think that, despite my vigilance, Younger Daughter must have found a way to grease the skids with Long Suffering Spouse. My wife gave in too easily. Younger Daughter materialized at my wife's side when the call from her brother came in, too. Younger Daughter really loves that dog and I'll bet you any sum you care to wager Oldest Son tipped her off as to when he'd be calling. Then came my moment of ultimate humiliation: Long Suffering Spouse handed me the phone. "He has to ask you, too," she said. "What happened to the plan of bringing the dog with?" I asked forlornly. "Ah," said Oldest Son, "Um. We found out that you have to have a certificate of good health from a vet before she can fly and we found out too late to get one." "And we found out that we'd have to pay an extra $150 both ways for her, even though the dog carrier would fit under our seats." "So, anyway, Dad," Oldest Son stammered, "can we leave the dog at your house when we go to San Antonio?" I looked at Younger Daughter's pleading face. I looked at Long Suffering Spouse -- and her expression was just as pleading. "I suppose this is the part where I'm supposed to graciously acquiesce, right?" My wife nodded. Younger Daughter held her breath. "Oh, alright," I said, defeated. "But I don't want any Christmas Miracles in my shoes," I began... and Long Suffering Spouse snatched the phone back to seek reassurances that the dog had mastered paper training in the month since Thanksgiving. Of course it has, said Oldest Son. I went back to the den and fell asleep in my chair watching the news: Mr. Irrelevant at home with the family. In our next episode: You only brought two doggie diapers -- for a five day stay? This Tom Toles political cartoon was captured from the Washington Post, but I saw it this morning in the Chicago Sun-Times. 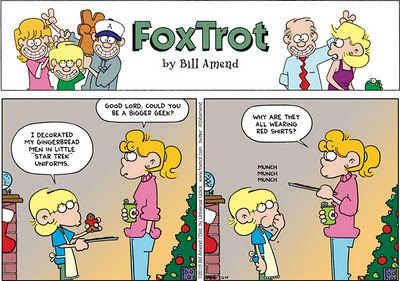 OK, this Fox Trot comic (image obtained from Yahoo! Comics) didn't just catch my eye this morning; I saw it Sunday in the Chicago Tribune. But other Star Trek afficionados, like my old blogfriend Jean-Luc, will find this pretty darned funny. By the way, if any of these cartoons appear to be in soft focus, just click on them. The image that opens in a new window should be clearer. Über-blogger Ken Levine, a former rock 'n' roll DJ who wrote for M*A*S*H, Cheers, Fraiser, The Simpsons and so many other shows, and who still has found time to broadcast major league baseball games for the Seattle Mariners and the Baltimore Orioles (and now does post-game work for the Dodgers), makes his Christmas movie recommendations this morning. Among Levine's recommendations was "Bachelor Mother," starring Ginger Rogers and David Niven. You might have to stop the DVD periodically to explain the cultural issues involved to the 'young people,' though: See, Ginger Rogers takes in a foundling -- in a time when single mothers moved to new towns and claimed widowhood. David Niven is the son of the plutocrat who owns the store where Ginger is, and isn't, employed. And David's father, played by Charles Coburn, gets some very wrong ideas about Ginger and the foundling and his own son. But it all works out in the end. Levine's post got me thinking about other Christmas movies you may want to check out over the holidays. Let's stay with David Niven for a moment and go with "The Bishop's Wife" -- one of my wife's favorites. Sakall also played Otto Oberkugen in the Van Johnson-Judy Garland musical "In the Good Old Summertime." Like the later "You've Got Mail," "Summertime" was a sort-of, semi-remake of a movie set at Christmas in Hungary, "The Shop Around the Corner." I'll be looking for that Jimmy Stewart movie in the next week or so, too. I'd boycotted that other Jimmy Stewart Christmas movie for several years, finally breaking down a week ago or so, and weeping all the way through it just like I used to. But if you're looking for a Frank Capra Holiday-themed movie that doesn't have Henry Travers as an "angel, second class," consider "Meet John Doe," starring Gary Cooper and the aforementioned Barbara Stanwyck. Of course, it's a tad dark. And if your imagination is still running with Jimmy Stewart down the main street of Bedford Falls but you can't bring yourself to watch that movie again, try the movie that was advertised on the marquee of the theater in the little town that Lionel Barrymore couldn't control after all: "The Bells of St. Mary's." And you can't mention this Leo McCarey classic without mentioning "Going My Way." ("Bells" is usually thought of as the sequel to "Going My Way," but IMDb says "The Bells of St. Mary's" was actually written first: In order to borrow Bing Crosby from Paramount for "Bells," RKO had to allow Leo McCarey to write and direct "Going My Way", based on the same character.) "Going My Way" is often shown at Christmas and provides a Bing Crosby alternative for those tired of "White Christmas" or even "Holiday Inn." There are a couple more movies that come to mind that I haven't seen in a long, long time: I'm looking for "A Bell for Adano" and "We're No Angels" and if anyone knows when either of these will be on, I have space on the DVR. Can you suggest any other Christmas movies that might be slightly off the beaten path? Related: Holiday movie favorites: An Unscientific Survey. Yes, there is some overlap between the lists. Actually, it wasn't just the electric bill I lost. I had been carrying the electric bill around with me, in my briefcase, because it is one of the mid-month bills, and one I've been paying faithfully. ComEd will turn off your power without a backward glance if you fall too far behind. I remembered I had been carrying it around, but I had no recollection of putting it anywhere. Meanwhile, at work, I was looking for a copy of an insurance policy on a particular file. I'd been carrying this file around with me for weeks, during my recent appellate brief binge, thinking (allegedly) that I might get to the opinion letter on that file as a change of pace after dinner or over the weekend. As if. Anyway, though I had the file, I couldn't find the policy. Yes, this too had been in my briefcase. Upon inspection, I discovered that my briefcase was manufactured by Bermuda Triangle Faux-Leather Goods, Inc. I took out each and every paper in the thing -- the creators of Dr. Who may have been inspired by my briefcase -- but I couldn't find the policy. I tore apart my office looking for it -- putting mounds -- mountains -- of paper into the recycling. That, sadly, had been the probable fate of the policy for which I was looking. It was probably swept up in some other panic clean-up and discarded after first being misidentified. The electric bill became the subject of a separate search during the course of all this. I began to suspect -- after getting rid of all that paper -- that my electric bill might have been accidentally swept up in the maelstrom. At home, meanwhile, while Long Suffering Spouse was staying up late every night working on the Christmas cookies, I continued looking for the electric bill. My wife likes to listen to Christmas carols as she bakes, so I was supposed to pull out a selection of CDs for her and put them on. And in the course of that I noticed I was missing a couple. Where could these be? And the more I looked for things, at home or at work, the more I found things I didn't know were missing. Yet. It was not a particularly productive week. Unless you count finding the electric bill -- yesterday -- as an achievement. And you still can't see my desk. Some people who say they have to get organized are fishing for a compliment (you're one of the most organized people I know!). When I say this, however, I achieve a new achievement in understatement. My posts this week might be seen as just a tad negative about the upcoming (onrushing?) holiday. It's the stress of the season, I suppose. The Holidaze. But I've kvetched about this before. 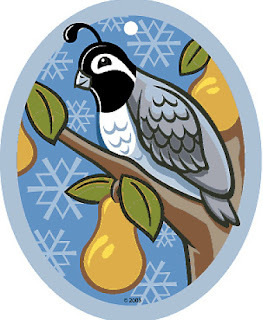 Although the stores start putting Christmas merchandise out around Labor Day, and the radio starts spouting Christmas carols before the debris from Halloween is picked up, the so-called 12 days of Christmas have been condensed, as a practical matter, into about 12 hours -- from noon, roughly, on Christmas Eve until about noon on Christmas Day. 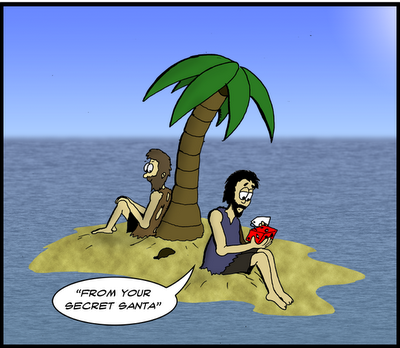 And, yet, isn't Christmas Day just the first day of Christmas? I tried to play the game once. I tried to do all the family obligations within the modern time provided. Once, mind you, just after I became a parent. We went to Nochebuena at my in-laws' home. We came home and wrapped more presents. We went to Midnight Mass. At the crack of dawn, we got up to start packing up my wife's 1978 Sunbird for the trip to Boondockia, the distant Chicago suburb where my parents lived. Maybe the Sunbird was a 1977 model. Either way, cars like that one gave Japan a huge leg up on the American auto market: One time, the driver's side door fell off. I'm not sure how we got all of the baby's stuff into that little car: You know, the bags and diapers and bottles and blankets and toys and stuffed animals and more blankets and rubber pants and 16 changes of clothes (just in case). And more stuffed animals. The kid couldn't have weighed more than -- what? -- 20 pounds at 10 months, probably less. Yet there were at least 10 pounds of stuff that was absolutely necessary to bring for every ounce of that poor child. I don't remember trailing a U-Haul behind us, but, looking back, I have to wonder how else we could have brought everything. Anyway, having risen with (or before) the Sun, and working diligently throughout, we were ready by sometime in the early afternoon to begin our journey. We even remembered to carefully bundle up the baby and get her into the car seat. We arrived in time for a late afternoon dinner, even after unpacking. I can't remember now who was there besides my parents and siblings. One of my aunts and uncles probably. Everyone fussed over the baby, who became increasingly grumpy with each passing minute that she was taken out of her daily routine. My parents were not stupid: When Older Daughter grew too cranky, she'd be handed back to me or my wife. If we could calm her down, someone would take her back... and the cycle would begin anew. Come to think of it, I can't remember exactly what we did that night. I just remember being more tired than I could ever remember and vowing never, ever to try this again. Thus, when Older Daughter, now grown and married, complains that she'll miss Christmas with us, and I say there are 12 days of Christmas and we'll be pleased to see her and Hank when their schedule permits, I really mean it. I really, really, really mean it. We'll all be happier. I mentioned Yogi Yorgesson in yesterday's essay -- and it occurred to me that not everyone would catch the reference. If you press play, you'll hear Mr. Yorgesson's magnum opus, "I Yust Go Nuts at Christmas." For you young people in the audience, the spinning object pictured in the video is called a "record." It is spinning on a device called a "turntable," in this case at a giddy 78 revolutions per minute. The instrument through which the music is picked up off the record and fed into the speakers is called a "tone arm." At the end of the tone arm is a needle. Seriously. It is riding along in the "grooves" on the record, where the data (the music) is stored. There is one song on each side of this record. For those of you who wonder where why the word "album" is used for music collections, imagine four or five of these 78's, in their respective paper envelopes, bound up in a binding: It would look like a picture album, at least a little, on the outside, but it would be instead a record album. By the time that multiple songs could be put on single 12" vinyl discs, the term "album" had come to have its present meaning. You kids still use the word "album," right? 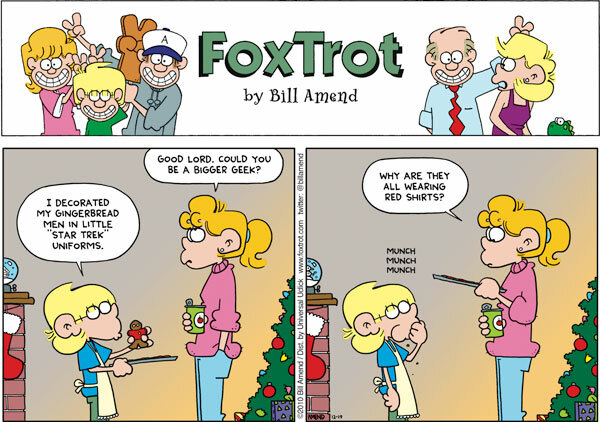 The thing about special family holiday traditions is that they change. Looking back through a nostalgic gauze, we have a tendency to forget this, but the truth is that kids grow older, people move, relatives die or divorce, and the family celebration this year will probably little resemble the one of five or ten years ago. I don't think that's just true for our family; I think it's probably the same for yours, too. Actually, I've been participating in the Nochebuena gathering at my mother-in-law's (Abuela's) for nearly 30 years now -- but, in the interim, my father-in-law has passed away, my children have all been born and two of them are themselves married. Things change. My mother-in-law will keep this gathering going for as long as she is able. For years, she made paella for this dinner; last year, I think, was the first one where she acknowledged that, perhaps, this had become too much for her to do. It is my mother-in-law's wish to keep her family together and to forge ties that will persist even when she is no longer with us. I suppose this is every mother's wish. But my wife's older sister has not been part of these gatherings now for many years -- certainly not since my father-in-law (Abuelo) died. He died 12 years ago; if he were alive today, he'd be 98 years old. Long Suffering Spouse and her older sister quarreled over how best to take care of their father in his final days. There was no question that Abuelo was succumbing to congestive heart failure; he'd been failing for a long time and he'd finally lost consciousness. But my wife's older sister is a physician. Her specialty was psychiatry but, before her first child came along, she had begun training as a surgeon. Anyone whose loved one is dying wants to do something. Long Suffering Spouse wanted to make her father as comfortable as possible -- and to say a lot of bedside rosaries. My wife's older sister -- I've called her "Dr. Doom" for years, for reasons entirely unrelated to this -- wanted to cut. Draining the buildup of fluids would only buy the poor man a longer coma and would be extraordinarily painful. So the sisters fought. My mother-in-law sided with Long Suffering Spouse and Dr. Doom and her husband stormed from the house. My wife and her older sister haven't spoken since. It's only in the last few years that Dr. Doom has begun speaking with her mother again. And they live outside of the country anyway. Long Suffering Spouse has one other sibling, a younger sister. I introduced Josephine to this blog on the occasion of her then-pending wedding (which was either her second or third, depending on how you count, since she married her first husband twice). Josephine's marital status has been a source of tension at prior Nochebuenas, I assure you. Now Josephine will be attending this year's gathering with her new husband, Ferdinand. Josephine excepted, of course, nobody likes Ferdinand. Ferdinand is in his early 60's -- he's at least 15 years older than Josephine, maybe 20. (And he doesn't look it -- which, on some level, probably bugs me as well.) My kids -- Older Daughter included -- have denounced him as weird and scary. It's not that they were particularly fond of Josephine's first husband, either. They just have some instinctive loathing of Ferdinand. Of course, maybe I'm being unfair. Different does not mean dangerous. But Ferdinand is not just a hugger, he's a singer. Now my son-in-law, Hank, as I mentioned yesterday, is a singer, too. But Hank doesn't sing in my house or try and get everyone singing. And, admittedly, I've been known to sing, too, but usually after too many libations. When I start singing "Seven Old Ladies," Long Suffering Spouse knows it's time to pour me in the car and take me home. Ferdinand is different. Ferdinand has busted out singing at Abuela's (she's told us) and he seems oblivious to the discomfort this causes. Ferdinand's tastes, from what we've heard, run mostly to religious songs. Although divorced and remarried, he considers himself more Catholic than the Pope. (Well, he allegedly did get his first marriage annulled.) Christmas, I'm afraid, may be too great a temptation for him. If he starts in singing, though, I'm going to start counter-singing from the Yogi Yorgesson catalog. We are not looking forward to our visit with Ferdinand on Nochebuena -- but I will do my darndest to be civil and to keep my kids civil too. I will smile and make small talk and put on a festive face. This will be for Abuela's sake. I will also drink heavily. This will be for my own sake. So why would Older Daughter want to come home for this? I think I'd much rather listen to a lengthy choral concert in a church, even sitting away from family, among near-total strangers. Even if it does go on for hours. It occurs to me that Ferdinand might like a lengthy choral concert. Too bad Hank's church is in Indianapolis. If we could swap him in and take Older Daughter out, that might be the best possible thing. But this too shall pass. Things change. Before she married Hank, during their seven-year courtship, Older Daughter was apparently indifferent to our Curmudgeon family holiday traditions. No, Older Daughter wanted to spend time in Indianapolis, with Hank and his family. We rolled our eyes a bit, but went along. Now, though, things are different: Older Daughter and Hank are married and living in Indianapolis close by Hank's parents. And all of Hank's friends from grade school and high school. And close by Hank's church, too, where he's sung (with his parents) in the choir since he was a boy. It's an impressive choir. They sang at Older Daughter's wedding, naturally, and they were quite good. Of course, Hank's family church was remodeled with the choir in mind: The choir dominates the sanctuary, surrounding the altar. I have wondered, from time to time, whether that church has any members who aren't in the choir. I have kept these musings to myself, however. Naturally, as a paid singer, Hank can't miss Christmas -- right? Well, insists Older Daughter, he'd promised to tell the choir he'd be unavailable Christmas Eve this year so that he and Older Daughter could spend that time with us at my mother-in-law's home for Nochebuena. (Why Older Daughter would want to do this is beyond me -- for reasons I'll probably explain eventually. If not today.) But, apparently, Hank 'forgot' to tell the choir director and, before you knew it (probably by Labor Day) rehearsals were so far advanced that Hank couldn't possibly back out. So Older Daughter says she wants to come up for Christmas Eve on her own. Sitting in her husband's church by herself, watching him sing for hours on end, does not strike her as a lot of fun. So why doesn't she join the choir now, you ask? Well, she did -- sort of -- but, unlike our own parish choir, where (as I understand it) many of the members show up on Thursday evenings for rehearsals if they're not otherwise engaged, these Episcopalians are dedicated Artists. Older Daughter, a nurse, had to miss a couple of rehearsals because of work obligations and the choir director sniffed at her about her lack of commitment. She took offense. Well, that's what I got out of the conversation. Anyway, she's not in the choir for Christmas. And maybe not at all. So, yesterday, Older Daughter called me at work to tell me about the outcome of her latest doctor visit (for her knee) and, later, about her trip to the dentist, and in the course of these interruptions asks, "How would you and Mom react if I came up for Christmas Eve alone?" Hank, she assured me, was totally fine with this plan. This was no time to sugar-coat, I thought. "We'd be furious," I said. Now that's probably an overstatement. But I was trying to make a point: When you marry, you and your spouse have to work things out between you. And going your own separate ways is not the same thing as working things out. So I did not waver. "We'd be furious," I said again. "Fine," she said (there's that word again! ), "I won't bring the subject up again." And she might not. But the odds are 50-50 she'll show up anyway. That's the challenging question posed by "Landgirl," a transplanted Midwesterner now at Home in the Highlands. The Scottish Highlands, that is. She writes, "I'm doing an unofficial poll of real Americans in response to a BBC series over here trying to define America." Although I'm anonymous, I'm quite real, and quite willing to take a crack at this one. First, America is not just a place. The space we occupy on a map isn't even particularly important (although, once you're in you're required to stay in. See, Lincoln and the Civil War). It is for this reason that the very notion of "Homeland Security" bothers me so. Germany has a fatherland. Russia has a motherland. But America is the only nation, ancient or modern, that is founded more on shared ideals than geography. Geography is at the root of most nations. Or religion. Or ties of blood. Sometimes combinations of these three things. But not America. What makes America America is that we hold these truths to be self-evident: That all men are created equal, that they are endowed by their Creator with certain unalienable rights, that among these are life, liberty and the pursuit of happiness. That to secure these rights, governments are instituted among men, deriving their just powers from the consent of the governed. We the People of the United States haven't always lived up to these ideals. The tired, the poor, the huddled masses of the Old World yearning to breathe free, the wretched refuse of their teeming shores -- these were not always welcomed to America with open arms, and certainly not always and by everyone in accord with our highest ideals -- but where in the world have more been welcomed better? America is a state, of course, like France is a state, or Germany. (It's a grammatically incorrect state: The United States of America is a state... but I digress.) The point, though, is that unlike other states, America is also a particular state of mind. And that is where the notion of American exceptionalism comes from, at least for me. So many people, here and elsewhere, are 'one worlders.' Human progress will be stifled, they think, and wars will flourish, until we are all united under a single government. Some idealists at the end of World War II saw in the United Nations a vehicle for eventually accomplishing this goal. Many other Americans have been scared to death of the U.N. for that very reason. I don't know if this abstract discussion has really explained what I think America is. An evening of Frank Capra films will help: Mr. Smith Goes to Washington, Mr. Deeds Goes to Town, It Happened One Night, It's a Wonderful Life -- even the much darker Meet John Doe. No, we don't always live up to the ideals portrayed in these movies either. And sometimes that spirit is sorely lacking here in the sinful, wicked City. But not always. And I've been in small towns on bright, sunny days; I've felt the warmth of strangers' greetings; I've basked in the courtesy and respect of people I've never met and will never meet again and I am here to testify: Capra had it right. However, if you're not in a cinematic mood, you might want to read this post I put up in November 2007, about the South Korean landlords and the Iranian tenants. One final attempt to illustrate America: Before I was married, my future wife's apartment was next door to a synagogue. I was a frequent visitor at the apartment, of course, and, one Fall evening, the future Long Suffering Spouse and her roommate and her roommate's boyfriend (now her husband) and I were all out on the back porch of her building looking down into the Sukkah constructed behind the synagogue. It was after dinner, near dusk. We were watching the little kids from another apartment in my wife's building playing around the Sukkah. The kids were Iranian (around the time of the Shah's fall, there were a lot of Iranian immigrants in Chicago). It occurred to me, even then, that we were four Catholics (of Irish, Cuban, German, and Lithuanian descent) happily watching Muslim kids playing in the yard of a Jewish house of worship. The wide open spaces of the West and the cornfields of the Midwest are uniquely American -- but so, too, was this tranquil scene around the Sukkah. While in the middle of working on that seemingly interminable brief I would generally dodge calls from bill collectors and salespeople. But, no matter how busy I am, I firmly believe it is poor policy indeed to dodge calls from my one paying client. Thus, no matter what, when that number pops up on the Caller ID, I answer. It should have been a simple matter: Pull the file down off the shelf, photocopy the statements in question, and send them off as requested. And, no, I didn't lose the file. But, when I pulled it out, I noticed that my file copies were all marked up. I'd used these statements as exhibits for a deposition and the copies I had were the copies I'd used to help me frame my questions. But I wouldn't have shown the witness marked up copies. Where were the clean copies? I am a creature of habit. You may say that this is boring and predictable -- and I will not disagree. It is also useful. When you do things the same way every time you don't have to remember what you did on this one occasion. You only have to remember what your usual and customary practice is. Doubt settled in. This wasn't really a deposition -- not exactly -- though it was a sworn statement that I intended to produce in the coverage case I've filed in this matter. Maybe... just maybe... I'd departed from my usual practice, then, and not asked the court reporter to attach copies. I looked again for clean copies of the statements elsewhere in the file -- but I couldn't find anything. I should point out that this takes less time for you to read about it than it did for me to puzzle this through: My easy task was starting to take hard time. OK, I thought, maybe I can re-create clean copies of these statements using the photocopier and strategically-placed Post-It notes. I have spent many happy hours (well, not 'happy' -- but many hours, surely) standing in front of the photocopier over the last few decades. I tell people that the sickly green pallor of my skin is caused by the photocopier light. But I had marked up these statements pretty thoroughly. Even though these statements were all pretty short, it was going to take me a looooooong time to pretty them up. And they probably weren't going to look pretty at all, no matter how long I labored over them. They were going to look altered. Attorneys just love to get statements that look altered. We're paranoid to begin with. This sort of thing just sends us spinning off to new heights of suspicion. After taking far too long to this conclusion, I came to another one: Maybe the court reporter had the clean copies anyway but had, for some reason, not included them. The reporter who'd taken the statement wasn't in, of course, but the receptionist said someone would get a hold of her and get back to me. The phone rang. It was the court reporter and, sure enough, they did have the statements. There was a reason -- and I didn't really care whether this was a good reason or a flimsy excuse. I was happy to get the news. And, within the hour I had the clean statements, too. Total time spent chasing this down: Two hours, give or take. Billable time? More like .30 hours -- the time it took to prepare the letter transmitting the statements. The immediate cause of my recent blogging hiatus was an appellate brief. It was due Monday -- on double-secret probation final extension. I couldn't write here because I had to write that. It's not that there are a lot of similarities between the kind of writing you find in a blog, even one as literate and erudite as this one (there will be a brief pause now while you roll your eyes): Sentences in briefs and blogs alike should start with a capital letter. But in a blog we have digressions, in a brief we have footnotes. This blog is written (believe it or not) to entertain; a brief is written to persuade. Soaring phrases and purple prose may be persuasive on the campaign trail, or in the pulpit, but mastery of the facts (the record) and application of the law to those facts is the only way to 'sell' an appellate brief. And it still must be done in a way that keeps the reader awake, if not actually engaged. Actually, I usually find that "writing" an appellate brief doesn't involve a lot of writing at all, not until the very end. Even though the brief was due Monday, I probably didn't actually write a full paragraph of the brief until the end of last week. Most of my time was spent fretting. You may ascribe this to my own neurotic personality; I've often thought someone else might be able to better tamp down his or her fears and charge more fearlessly into the creative process. Maybe I'll explain why I was fretting so much about this particular case in another post; for now, suffice it to say that a lot of my non-fretting, actually productive time was given over to preparing an Index to the Record. Our rules require appellants to provide document by document descriptions of everything in the record -- sometimes that means page by page. There is no better substitute for learning what transpired in the trial court than performing this exercise no matter how excruciatingly boring this exercise may be. Especially in a case, like this one, where the record is 30 volumes long. Here in the County of Cook, each volume of the record on appeal is supposed to be 250 pages long. There were 29 full volumes in this record and a partial 30th volume -- thus, over 7300 pages of paper to be examined. Not all of it actually belonged, of course. But I will defer complaining about the deficiencies of our Clerk of the Circuit Court until some other time. Anyway, you will wonder, by now, those one or two of you who have stayed with me this far, where the "glamor" will come in. And I have held you in suspense long enough. After staying up all night Sunday to finish the project, there still remained the task of returning the record to the Clerk of the Appellate Court: The other side will need the record to prepare its brief. The Appellate Court Clerk's office serves as the neutral ground where the exchange may be made. Besides, the learned justices (or, in this case, almost certainly their clerks) may, at some point, wish to peruse the contents of the record for themselves. There are certain logistical challenges inherent in requiring one middle-aged man to move three boxes of stuff, particularly in this security conscious era. It's not like I could tote one box over to the building which houses the Appellate Court and leave it in the lobby while I went back to retrieve its companions. Even though my Undisclosed Location is only a block or two away, the Bomb Squad would probably be summoned before I made it back to my own building. Somewhere along the line I have acquired a cart for just these occasions. One box went into the cart; the other two were carefully stacked on top. If I didn't mind crushing my fingers, I could maneuver the cart without too much difficulty. It's cold today in Chicago anyway, so I wore gloves. That helped with the crushed fingers. Because it is only a short walk from the Undisclosed Location to the Appellate Court, I did not anticipate any difficulties. True, the wheels on the carts objected to the 'bumps' on the wheelchair ramps at each corner (which, during periods of snow, ice or rain, make those ramps safe to use by persons not in wheelchairs) but I could compensate. I almost lost the load only once, as the cart found a large crack in the sidewalk on Randolph Street just a little bit deeper than I thought it was. Still, short walk and relatively smooth surfaces notwithstanding, I was huffing and puffing when I got to the Appellate Court. Now my load had to be unstacked and run through the x-ray machine, box by box. My coat, glasses, phone, keys -- all that stuff had to be x-rayed as well. And that was after I'd shown my ID. I don't really think that all of this is particularly necessary: It seems to me that my ARDC card and the photo ID that I use at the Daley Center should suffice for the Appellate Court as well. But at least the security staff at the Appellate Court is generally good-natured. Also, it's not terribly busy most times, so (unlike at an airport, for example) I wasn't subjected to the death glares of persons waiting their turn during the time I had to spend putting my load back together. And the security at the Appellate Court is very even-handed: Years ago, back when they started screening all entrants, I was in line behind a recently-retired Illinois Supreme Court Justice. He had to empty his pockets just like I did. But there I was this morning, sweaty despite the cold, my back twinging from the too-short handle of the cart, restacking my document boxes... yes, I thought, here is a good illustration of the true glamor of the solo practice of law. And something you'll never see on TV. Life never throws you a curve when two or more would be more interesting. We'd gotten Younger Daughter home from the hospital for the weekend (she's the one who had food poisoning, we think) and we provided TLC and movies on DVD and chicken soup and that sort of thing through until Sunday night when Middle Son took her back to her dorm. He had no sooner left than Youngest Son began complaining of ill health. He'd avoided his sister over the weekend, mainly because she was on the couch in the den that he considers his exclusive domain. So he went out Friday night and Saturday night and somewhere in the course of his travels picked up the delightful norovirus. As Youngest Son began demonstrating in earnest as Sunday evening deepened into Sunday night. I had to go to work next day. I was told I'd be getting a check -- a small one, in comparison to what I owe -- but one that would, inter alia, repair relations between my Long Suffering Spouse and the computer guru at her school. He had done me a favor -- a big one -- and I hadn't paid him. And he was increasingly unhappy. Thus it was that I didn't protest too much when, at about 2:00am Monday morning, Long Suffering Spouse decided (a) Youngest Son must go to the ER and (b) she would take him on her own. I was to stay behind and prepare for the trials of the day to come. As usual, I was woefully under-prepared. It started when I opened the weekend mail. There was an envelope from the Clerk of the Seventh Circuit Court of Appeals. I have an appeal pending in that court. It's not that I don't like the Seventh Circuit. Courts are institutions that command respect. Liking or not liking is irrelevant. But I had an appeal there last year, too, and my client stiffed me for about $16,000 in fees and costs. And in the course of this experience I also got hammered for $4,400 in sanctions for filing a motion that the court deemed unwise. I was concerned about the consequences of filing it -- before I filed it -- but I had access to one of the leading lights of the Illinois bar on legal ethics (he was also representing my client, but in another matter) and he seemed to think my motion was just a great idea. Looking back, I think he must have thought it was great that my name was on it and not his. But you may well imagine, from this brief digression, that I am wary of the Seventh Circuit Court of Appeals. I do a lot of appeals, but nearly always in state courts. The rules are different in federal practice. Lots of things are different in federal practice. One way in which the federal practice differs from the state practice is that the feds are much more technologically inclined. So things are filed in the District Court electronically. Dockets in both the District Court and Court of Appeals are on line -- and, unlike, say, the electronic docket provided by the Clerk of the Circuit Court of Cook County, the federal dockets are accurate. Appeals in both the state and federal systems are begun in the trial courts. So when I filed this latest appeal, I'd received, from the District Court, in my email, confirmations and copies of the case initiation papers issued by the Seventh Circuit. I was paying attention to these. So -- when I got a big fat envelope from the Clerk of the Seventh Circuit containing a copy of my Notice of Appeal and the other initiating papers issued by that court, I pitched it in the recycling. I had all this stuff didn't I? Why did I need duplicates? This was somewhere around mid-October. Now, in the second week of November, when I saw the little envelope from the Seventh Circuit, I was not overly concerned. It might be a briefing schedule, I thought, or it might be a diversion to the court's settlement attorneys. I'm really hoping for that in this case. But, alas, I was wrong on both counts. The Seventh Circuit had entered an order on me, personally, to show cause why I should not be held in contempt for failing to respond to its October orders. My best guess -- looking back -- is that somewhere in that batch of paper I'd pitched a few weeks before there were copies of a couple of orders asking me to amplify certain aspects of my Docketing Statement. I wasn't looking for them because (I thought) I'd gotten everything in my email. I pulled the case up on Pacer (using the Seventh Circuit website this time) and, sure enough, found the orders in question. There followed the awkward telephone calls and emails to co-counsel and the formulation of a plan. I would respond to the court's show cause order, of course, but (since the court had given me until Friday) I would also respond to the substantive orders dating back to October and present these along with a motion for leave to file instanter. I looked up the cases, I drafted responses, I prepared my motion, I prepared a supplemental Affidavit to the extent that I could. However, I still needed information from the client that my co-counsel (who represents the client on a regular basis) would have to obtain. I sent everything off to co-counsel on Tuesday evening -- and by Wednesday morning was retching my own guts out with the norovirus. One of my co-counsels decided how the affidavit would be best completed and got the client's president to sign his name. Another of my co-counsels signed his name to my response to the show cause order. I got back into work the following Monday and soon received another envelope from the Seventh Circuit. My co-counsel had misinterpreted my emails regarding the completion of the affidavit and had provided y when the court wanted x. I had to fix that. When I brought in my revised and supplemental, new and improved amended response, complete with new (but as yet unsigned affidavit -- that's another story) I asked the Clerk about the response to the show cause order, explaining how it happened that someone else had signed his name to my writ of rachmones. He jumped away from the counter. When I assured him that, by now, I was surely no longer contagious, he went and spoke with his supervisor. The bottom line was I didn't have to re-sign anything and I haven't been sanctioned. I love old movies, comedies and musicals mostly, and one of the reasons is that I love the timing. Things are said, crisp rejoinders follow; there's a song cue and an orchestra springs into action and everyone in the frame falls into a choreographed routine. I love Jack Benny. He could say something -- or, more likely, nothing -- and get a huge laugh. Then he'd extend the laugh with a perfectly timed "Well!" I only wish that timing could be so precise in real life. I return to blogging today only momentarily: I still have a massive pile of stuff on my desk that is screaming for attention. Some of this stuff has been screaming since before I immersed myself in the appellate brief that I turned into my co-counsel yesterday morning. After an all-nighter. I didn't hear from her again yesterday. Either the brief was acceptable to her and the trial attorneys who engaged her -- or I won't be involved in the scramble to do something different or additional and the desperate motion for leave to file instanter that would have to follow. Because yesterday was the last and final, double-secret probation filing deadline. I did pick up a check yesterday that I can deposit today. And pay my November mortgage. We got the November office rent paid on the 30th. The check was dated November 3rd. November 03, if you will. "You won't believe it's simply because I'm dyslexic?" I asked the landlord. At least she smiled. And forget about bill collectors. Their calls are never welcome, though they're increasingly frequent. But isn't it always the way that the guy you don't want to hear from calls just before you can do something about the matter he's calling about? Absent from my office on Friday and almost all of yesterday, I missed two calls from a retail client out in California who's wondering about a motion he hired me to write. It's one of the top items on my to-do list -- but the appellate brief -- the norovirus -- the rule to show cause from the 7th Circuit -- all these have crowded his piece of business to one side. And he sent in a retainer, too, which I dearly need and can not touch because I haven't done the work. Yet. I've already had a call from my best client asking about the status of an opinion letter that I should have done two weeks ago. So that makes items 1A and 1B on my agenda for today... and, yet, it's my Fifth Blogiversary and I wanted to post something. The last few weeks have provided a surplus of material, really, for the blogging mill. But I'll have to find the time to get to it. I do have another appellate brief coming due in a month. Yesterday, after racing into the office to scan some pages that needed to be included in the Appendix to the brief I'd finally finished -- after using Adobe to put the page numbers on (I felt so techno-competent!) -- I hopped into the family van and began to race home toward my couch and some overdue shuteye. Racing here being the operative word. I'd just gotten out the express lanes on the Kennedy when I notice a State trooper behind me. He was right on my bumper so I slowed down and moved over a lane (using my turn signal and everything) because I thought maybe he wanted to pass me. I correctly interpreted this as a bad sign. Just before the Accident Investigation Site at Lawrence, he put on his gumballs. So focused was I on getting home that I apparently breezed by him in the express lanes at 78mph. Really bad timing on my part. But he let me off with a warning... for which I'm grateful if (I acknowledge) not entirely deserving... and I got home and got some sleep. Now, before fatigue sets in again (it's always the day after the day after that fatigue hits hardest, at least for me), I've got to move on to 1A and 1B. Timing, after all. 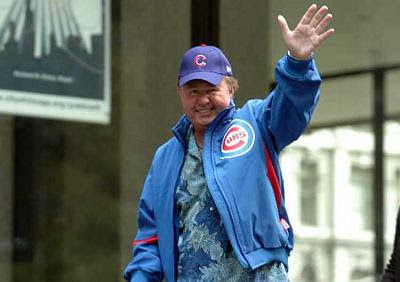 Ron Santo passed away last night. He had a stellar career with the Chicago Cubs. He was beloved as a Cub broadcaster. And I say this as a White Sox fan. And without snark of any kind. 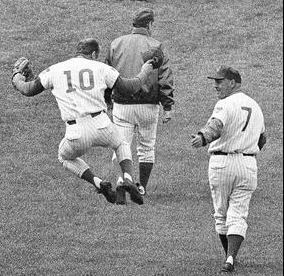 Santo will always be remembered for his clicking his heels in celebration -- particularly in that ill-fated 1969 season. I found this reminiscence on line this morning about the first time Santo clicked his heels in celebration and I thought it worth sharing. The irony, of course, is that Santo would lose both heels -- both legs -- before he died in the course of his lifelong battle against diabetes. Santo raised a lot of money in his lifetime for juvenile diabetes research. And he gave a lot of kids with diabetes hope that they, too, could succeed and excel in life and in sports. Current Chicago Bears quarterback Jay Cutler, for one. I'd also like to share this post I did, in late 2008, on the occasion of Santo being denied entry into the Baseball Hall of Fame. Ron Santo, requiescat in pace. Believe it or not, it was only Monday that the biggest story in Chicago was that Ron Santo was once again denied entry to the Baseball Hall of Fame. Ron Santo is a beloved figure in this town. He's the color commentator on the Cub radio broadcasts and -- from what I'm told -- his comments are often just groans or shrieks or cheers, depending on what the Cubs are doing on the field. And he has a compelling personal story: He had a long and successful playing career even though he had juvenile diabetes. He's lost parts of both legs to the disease in recent years. He's not been in the best of health. I never really saw Santo play much. After all, he was only with the White Sox for one year (in 1974) and his statistics that one year weren't exactly Hall of Fame caliber: In 117 games for the Sox, Santo batted only .221, with just five homers and 41 RBI. He was used more as a DH or second baseman with the Sox; we had Beltin' Bill Melton as our regular third baseman then. I know some of you, knowing the rivalry between Cub and Sox fans in this town, may think I'm being snarky by saying that Santo should be relieved that he's not been enshrined in the Hall. But I'm being sincere. I'm thinking of the last great Chicago ballplayer who teetered on the cusp of Cooperstown for many years. I'm thinking of Nellie Fox. Every year, an ardent campaign would be undertaken to get Fox in the Hall. A lot of prominent people joined the Nellie Fox Society to promote his election. Fox died in 1975. He wasn't around to experience the annual ritual of his being snubbed by the Hall. In 1985, the last year of his eligibility on the writers' ballot, Fox got 74.49% of the votes -- just two votes short of the 75% needed for election. The Dean of Chicago sportswriters, the late Jerome Holtzman, later baseball's official historian, argued that the numbers should be rounded up so that Fox would be elected. The Hall said no. Like Santo, Fox had the numbers on the field to merit election. So -- every year -- there was a fresh outcry over the injustice of it all. Fox, long dead, remained very much alive in the hearts of his partisans. And then the Veterans Committee finally relented and Fox got in. 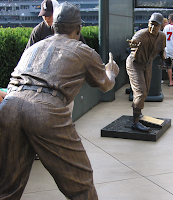 Fox has a statue now along the outfield concourse at U.S. Cellular Field. But it's just not the same. 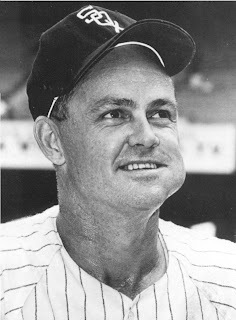 So -- Mr. Santo -- take it from me, a lifelong Sox fan: Don't be so upset that the Hall has denied you again. A lot of people are very upset for you. On your behalf. And you should bask in the glow of their genuine affection. No, I haven't abandoned this blog. Not yet, anyway. I'm working on a project at work that has consumed me these last few weeks. If I meet this last, final, double-secret-probation deadline for filing that brief, I'll be back next week -- in time, hopefully, for my 5th Blogiversay. I enjoy watching election returns. This past November 2, I had the TV clicker at my side and a whole bunch of websites to visit to get local results that weren't yet on the TV. In between, I was Facebook-chatting with Younger Daughter. Younger Daughter was at school, working as a desk guard in the dorm, and she wasn't feeling altogether well. The hamburger tasted wrong at dinner, she said; it was pink besides. I was yelling at her anyway -- well, I was typing at her with vigorous keystrokes -- because I knew she hadn't voted. I have voted in every election where I was eligible, even when I was an irresponsible college student. But example isn't everything, is it? Anyway, I mentioned then to Long Suffering Spouse that Younger Daughter was complaining about feeling punk. Long Suffering Spouse was not overly concerned. Sadly, Younger Daughter has had more than her share of stomach upset -- and dorm food has often been a suspect. Thus, we thought, it was just another incident and not worth bothering too much about. Opinions changed suddenly at midnight. I was still awake, still on the computer, still watching TV, but Long Suffering Spouse had yielded to the Sandman's charms and was asleep in her chair. That status changed, suddenly, when the phone rang. It was Younger Daughter, and she was crying. This was definitely a call for Mom. Apparently, in the four hours or so since Younger Daughter and I had chatted on Facebook, Younger Daughter's condition had continued to deteriorate, to the point where she was now violently ill from every orifice on the human body from which one may be violently ill. And it wasn't stopping. Long Suffering Spouse offered comfort and advice. We hung around the phone awhile longer, seeing if we'd be needed again, but around 1:00am we figured it was safe to retire for the evening. The local stations were wrapping their election coverage anyway. The clock by my side of the bed read 1:45 when the phone rang again. For persons my age, at least, phones do not ring at that hour for any good reason. I was therefore bolt upright and checking the caller ID in an adrenaline-charged heartbeat: It was Younger Daughter's cellphone number. But it wasn't Younger Daughter. It was her boyfriend, Olaf. "She told me not to tell you," he told me, "but you need to know. We're in the Emergency Room." A few questions established which one and Long Suffering Spouse and I were heading south on Harlem in just a few minutes. It was a small hospital, not a trauma center, and we were expected. We were shown to the ER cubicle where Olaf brought us up to speed. Younger Daughter's condition kept worsening to the point where the dorm authorities forced Younger Daughter to a decision: Let Olaf drive her to the hospital or they were calling an ambulance. It may well be love: Younger Daughter did nothing nasty to the interior of Olaf's car on the short drive over. She'd gotten so dehydrated so quickly that the doctors said she was lucky to have come in when she did; she would otherwise have been at risk for organ damage. They'd already rigged her to an IV by the time Long Suffering Spouse and I arrived. The first bag went in like water into desert sands. She had two more before they admitted her and moved her to a room at about 5:00am. I was sent home for a couple of hours before 6:00, that being the time that our legal overnight space became illegal during the day. Younger Daughter would be at the hospital until Friday as they ran all sorts of tests. Her white blood count was extraordinarily high Tuesday night/Wednesday morning and the medical staff had to rule out all sorts of scary stuff as a consequence. This they did -- but they failed to identify the actual cause of her illness. Was it really food? Or was it a flu-type virus? If the latter, we were probably doomed. Thus, I was rooting for a food reaction. Either way, Younger Daughter did not complain when we returned her to our house for the weekend instead of back to the dorm. She did not complain when Older Daughter (who had a couple of days off mid-week) drove up from Indianapolis to provide her own nursing services. The only one who complained, really, was Youngest Son -- and that mainly because Younger Daughter took up his accustomed space on the couch in the den. Long Suffering Spouse and I were too afraid of contracting this loathsome disease to complain much. We just waited. Olaf came by on Saturday to check up on the patient. We were worried for him, too. And when Youngest Son asked to go out Friday night, away from the house of sickness, we didn't hesitate: Go, we said. He went to a football game -- the parish grammar school (where my wife teaches) was playing for its conference championship on the field at Youngest Son's high school. It was cold, it was wet, and there were something like 60 kids out sick with a severe flu-like illness at the parish school, but Youngest Son could stand around and be admired by all the little kids. The high school AD loves it when his athletes attend games involving their ex-grammar schools. He sees it as a golden recruiting opportunity. And, like I said, Youngest Son couldn't be on the couch anyway. Middle Son came by to visit on Sunday. To visit and eat dinner. He more than paid for his supper, though, by offering to take Younger Daughter back to school. He lives near her school; his old alma mater is right down the street from hers. And, frankly, Long Suffering Spouse and I were tired. We weren't looking forward to spending the hour taking Younger Daughter back. No sooner was Middle Son out the door, however, than Youngest Son announced that he was feeling poorly. Pretty soon he, too, was vomiting and having diarrhea. It's not particularly difficult to do both of these activities at the same time; it is, however, difficult to do so in a way that does not require a Level I hazmat cleanup. Youngest Son created an environmental situation. Long Suffering Spouse took the brunt of this. Problem was, Youngest Son wasn't able to stop. I absolutely had to go to work on Monday the 8th -- a story I can't yet tell -- so I didn't fight too hard when, after consulting with the pediatrician, Long Suffering Spouse advised, in the wee small hours of Monday morning, that she was taking Youngest Son to the ER -- and that I was to stay home. Youngest Son went to a different ER, but the same actions were taken: Youngest Son got rigged up to an IV because he had also become badly dehydrated. He also got three bags worth of fluid and an anti-nausea medication that calmed him down enough to allow him to come home the next morning. Although I did doze in the course of all this, Long Suffering Spouse kept me pretty much up to date via text during this whole time. Long Suffering Spouse was now certain that she and I were doomed. Not for herself, of course; she can take care of herself. She was worried about me. I haven't had an illness of this kind since large quantities of my innards were removed nearly four years ago. There was some question, in her mind, as to what a bout of this business might do to me. As Long Suffering Spouse reported it later, when she outlined her concern to the ER personnel treating Youngest Son, they got something of a glow in their eyes that made her think they were seeing future business opportunities. The ER doc prescribed an anti-nausea medicine for Youngest Son to take home -- with the understanding that Long Suffering Spouse and I could also use it should the need arise. The need, and the gorge, arose for Long Suffering Spouse on Tuesday night. I followed on Wednesday morning. By Wednesday morning, Youngest Son had recovered to the point where he wanted to leave the house again. And who could blame him? By comparison to his parents, Youngest Son was the picture of rosy health. Of course, in the land of the blind the one-eyed man is king. Even in my state, I suspected that Youngest Son was not in as great shape as he thought he was. But Youngest Son was determined. He explained that there was a baseball meeting after school. He couldn't possibly miss that now, could he? That he had missed a history paper, a Spanish quiz, a math test -- these were of no moment to Youngest Son. These could be made up at any time. But miss a baseball meeting? Impossible. Long Suffering Spouse and I were in no position to enforce our wishes. We hoped, indeed, that he was doing sufficiently well to get through the day. Certainly we understood that he'd rather not stay home with us polluting the place. Thus, we bid him a reluctant adieu and went back to our respective miseries. The phone rang not two hours later: It was the school attendance lady. Youngest Son had been sent to her office; she took one look at him and said he could not drive home. That meant one of us had to go and pick him up. Since I was still on my hands and knees, and Long Suffering Spouse was no longer, Long Suffering Spouse drew the short straw. We're pretty sure that Younger Daughter and Youngest Son had different bugs. We think Younger Daughter's issues may have been food-related after all because Olaf never took sick. We had far more contact with Younger Daughter than did Youngest Son. If it was her bug that felled us, you'd think Long Suffering Spouse and I would have toppled before Youngest Son. But it went the other way 'round. So we think Youngest Son was the source of our illness last week. On the one hand, it is nice that a teenager is still willing to share with his parents. In future, however, we'd rather that he did not share his loathsome diseases with us. The good news? Neither Long Suffering Spouse nor I wound up in the hospital. I don't know if Long Suffering Spouse took it, but the anti-nausea medicine seemed to do the trick for me. That may be how I avoided a trip to the ER. Either that... or maybe I'm made of sterner stuff than my kids, right? No, I didn't think so either. Youngest Son finished his high school football career on Saturday afternoon. His team had made the playoffs despite a heart-breaking loss in its last conference game. That loss cost the team a home game; instead, we were set up as sacrificial victims for a local football powerhouse -- Long Suffering Spouse's alma mater, as it turns out. "Did you go to a lot of games here, Mom?" Younger Daughter asked as she settled in beside us Saturday afternoon. "No," said Long Suffering Spouse, "I was only in here once -- for graduation. They have the graduations outside when the weather's nice." Because it was Halloween weekend, a lot of the kids in the student section came to the game in costume. Green was the predominant color of all costumes on the visitors' side of the field -- we had only the green Teletubby, for example -- because green is one of the school colors. Younger Daughter also wore a green sweatshirt, and there was a greenish pallor to her skin. But I attributed the facial coloring less to makeup and more to how she spent the prior evening. My speculations were confirmed when I inquired. It wasn't hard to figure: Younger Daughter was hiding behind huge (non-prescription) sunglasses. She should have worn her regular glasses. She really needs them to see the field. She kept asking her brothers whether Youngest Son was on the field and, if so, where. They mocked her. You'll note that I've gotten this far into the essay without mentioning the actual game. The less said of it the better. There was one play in particular that suffices in itself to describe the day: Their quarterback dropped back to pass and we had three rushers closing in. But they couldn't wrap him up because he kept dropping back. Ten yards, 20, 30 yards behind the original line of scrimmage. He wasn't running straight back, not always; he was weaving from side to side, too, so he could see down field. (This was why they were afraid to try and bring him down, afraid he'd make them commit and get around them.) Still, it looked like our guys were going to chase him out of the other end of the stadium. Then he saw a kid come open far down the field. Very far down the field. The ball must have traveled 60 yards in the air, landing in the receiver's arms like it had been dropped from two feet away. (And this QB is a sophomore!) They scored on the next play. Or maybe it was the play after that. Whatever: They kept scoring. And so ended my last high school football game. Unless I live to see a grandchild play, this was the end -- at least, this was the last game I'll attend where I have a real rooting interest. Long Suffering Spouse and I added it up yesterday: Between grammar school and high school (and Oldest Son's 'intra-hall' college career), she and I have been attending football games for 15 straight seasons. My sons all played hard, in their time, and all, I believe, are better for it. They made good friends, they learned teamwork and cooperation, they enjoyed success -- and they learned to endure, and recover from, failure. These are lessons that you can't learn in books. And these are lessons I could not teach.